Apple just announced the launch of the iLens based on the report published in dailycurrant.com, a smart contact lens that works like the Google Glass but “better” according to James Milton, an Apple rep. The iLens costs $299 for 64GB and $499 for 124GB, and Apple hopes it will compliment the iWatch and iPhone. The iLens comes with a clear earpiece and is activated by a series of the user’s blinks. “Sure, you may look like you’re having a stroke when you wear an iLens, but still look less dorky than wearing Google Glass,” said the designer, Parker Johnson. 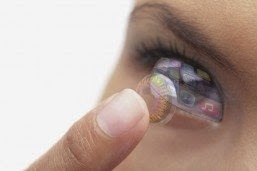 “It’s applied just like a contact lens, so a licensed optometrist will have to fit users for the iLens. Eventually Genius Bar employees will be trained in optometry. That is if you can get an appointment,” explained Milton. The iLens works just like an iPhone. You can see the time, make calls, send and receive texts, e-mails, even scroll through Instagram. “Cellphones have become a huge social faux pas. Nothing is ruder than the glow of an iPhone at a restaurant. That’s why iLens is so great. You can be playing Candy Crush or watching football and no one will ever notice. They may just think you have a tic.” explained Parker. “However, if the ticking becomes involuntary, consult a physician immediately.” A new series of apps specifically designed for the iLens will be released too. “Have you ever wanted to know what it would be like to sleep with Kate Upton or Ryan Gosling is like? With the new iFantasy app for only $19.99 a month, iLens will change your partner’s body and face to look like any celebrity you desire, without letting your partner know. Just make sure you scream out the right name,” gushed Milton. “The best part about the iLens may be the camera. Ever wish you could've capture a photo, but didn't have time to fiddle with your phone? The iLens captures everything automatically, so you’ll never miss an Instagram, even selfies. All you have to is look into a mirror and wink,” said Milton. Once in, the iLens is always recording and automatically uploading to iCloud, where users can pick which pictures and videos they’d like to post to social media. But is the government watching? The iCloud leak caused chaos earlier this year, and those were pictures people knew they were taking. What if there was an iLens iCloud leak? Allegedly the iLens will be beefing up security to be 98 percent effective. The iLens will be released May 2015 with the iLens Air model late 2015.